11 "Greenest" crossover SUVs: which is for you? Here are the 11 most environmentally friendly crossover SUVs, based on “Green Score” rankings compiled by the American Council for an Energy Efficient Economy. The scores are based on fuel economy and tailpipe emissions, as well as “cradle to grave” factors, such as the environmental impact of vehicle’s manufacturing process. Base prices include destination charges, which average around $850. And if you’re looking for the cleanest of all rides, check out 11 Greenest Cars for 2015. 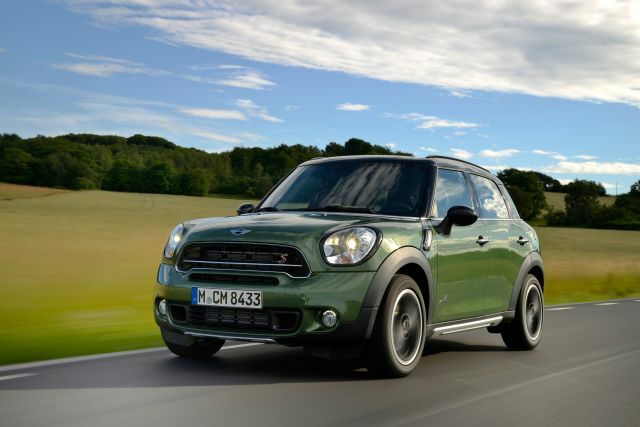 More sports car than SUV, the Countryman is essentially a larger MINI Cooper with four doors and a useable back seat and cargo hold, and the best is that it’s no less entertaining to drive. The top Green Score in the line is for a base model with the 1.6-liter 121-horsepower four-cylinder engine and six-speed manual transmission; a six-speed automatic is alternately offered, but gets three fewer mpg in combined city/highway driving. Even with the standard setup, the Countryman delivers truly crisp handling, with peppy, though not necessarily powerful, acceleration and a reasonably smooth ride; inside there’s a cleverly designed and sufficiently roomy interior. Those willing to sacrifice fuel economy and ride comfort for the sake of added acceleration and improved handling abilities can upgrade to either the Countryman S with its turbocharged 1.8-liter 181-horsepower four or the top John Cooper Works that’s the quickest and most nimble (also the harshest-riding and costliest) rendition, with 208 horses under the hood. The latter two versions can be fitted with optional all-wheel-drive (AWD). At that, the worst performing model in the line, fuel-economy wise (the JCW with AWD and an automatic transmission) is still rated at a respectable 26-mpg combined.